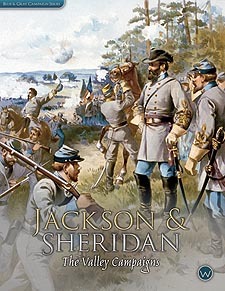 Volume III - Jackson & Sheridan follows the Shenandoah Valley Campaigns by Jackson in 1862, and Sheridan in 1864. As confederate General Thomas "Stonewall" Jackson in 1862 can you distract Lincoln and keep the Union reinforcements from getting to Union General McClellan at Richmond? As Lincoln can you get your generals to coordinate and trap Jackson with your overwhelming forces? In 1864 as Union General Phil Sheridan can you burn your way through the Shenandoah Valley, destroying the "breadbasket" of the confederacy and block the back door to Richmond? As Confederate General Jubal Early can you drive on Washington, or even stop Sheridan's overwhelming numbers?